your presentation to check your data. Presenters who will present in Room 1, Room 2, Room 3. Presenters who will present in Room 4, Room 5, Room 6, Room 7. Please come to the Operation Desk located in each session room. 1) Please prepare your data in Microsoft PowerPoint (Windows PowerPoint 2010/2013/2016). 2) Remote presentation system is equipped in each session room. You have a TFT monitor, mouse and USB keyboard on the podium to operate your presentation. 3) Audio playback is not possible. 4) Please make sure to be present at the designated front seats 10 minutes prior to the start of the session. 1) Only USB flash memories are accepted. MOs, floppy disks, CD-R, and CD-RWs cannot be accepted. 2) Windows (Windows 7) is the only operating system available for the presentations (If you have prepared the presentation data on a Macintosh, you are advised to bring your own computer). 3) Only Windows Media Player (Windows) and Quick Time Player (Macintosh) can be used to playback movie files. 4) Your media should contain only the presentation data for the Meeting. 5) Your presentation data file should be named as .ppt. 6) If your presentation data is linked to other files (i.e. still or moving images, graphs, etc. ), those linked files should also be saved in the same folder, and the links checked beforehand. 7) The Secretariat is responsible for destroying all copies of any data after the session. 1) Please check in at the PC Center and notify that you are going to use your own PC / Mac for presentation at least 30 minutes prior to your presentation. 2) The Secretariat will prepare a Mini D-sub 15 pin PC cable connector. If your machine is not compatible with this type of cable connector, please bring an adaptor to connect your machine to the Mini D-sub pin PC cable connector. 3) Please bring your AC adaptor with you. 4) The resolution of the LCD projector is XGA (1024 × 768). If your machine requires a resolution setting change, please change this setting beforehand. 5) Please also bring your presentation data on a media (on USB flash memory) as a backup file. 6) After checking connections at the PC Center, please bring your PC / Mac to the Operation Desk in the session room 15 minutes prior to the start time of your session. 1) Poster Session: Please follow the chairpersons’ instruction. ・Discussions should be held in front of your posters. Participants will be free to view the posters and to discuss with presenters during the designated time. ・Presenters have to stand by their own posters from 11:00 to 12:00 to answer questions from the participants. 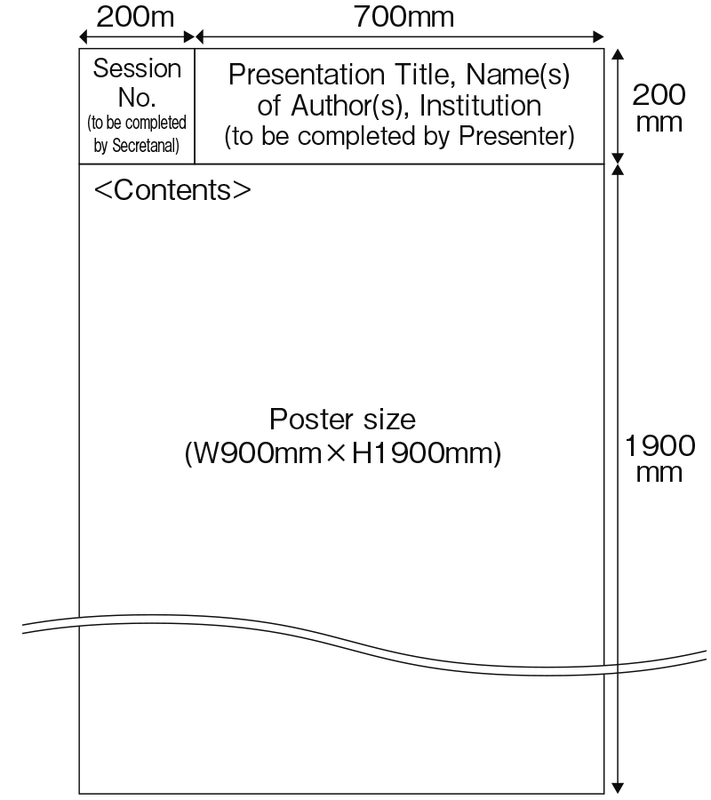 ・Stand by in front of your poster panel 10 minutes prior to your presentation. 3) Student Session: Please follow the chairpersons’ instruction. Poster presenters are asked to place their posters at the designated space in Poster Presentation Room and to follow the schedule below. * Any materials left behind after the removal time shall be removed by the Secretariat. * Please put on a ribbon during your presentation time. The ribbon is attached to a poster panel. *Please have a discussion in front of your poster panel during the presentation period. – The size of the poster panel is W900 mm × H2100 mm (W35 inch × H82 inch). Please prepare your posters to fit in this size. Each presenter is responsible for preparing their posters with the title, name(s) of author(s) and institution(s). – Secretariat will prepare pins. Please do not use any tape, etc. that is not provided by the Secretariat. 2) Secretariat will prepare a panel with your poster number. 3) Please prepare this slip with title, name(s) of author(s), and institution. takes place on the following date and location. All presenters of International Session are welcomed to join the ceremony. After the poster session, the awardees will be announced.